I hope your summer is off to a great start. Summer has rolled into Texas and temps have begun to rise, but thankfully football season will be here before we know it. This year has been flying by. The US market finally cooled off of its 9-year growth streak and has fallen back to levels set in November. While volatility has been back in vogue this year, our portfolios have weathered the recent roller-coaster ride well. We are pleased that fixed income and other alternative assets have worked as designed. 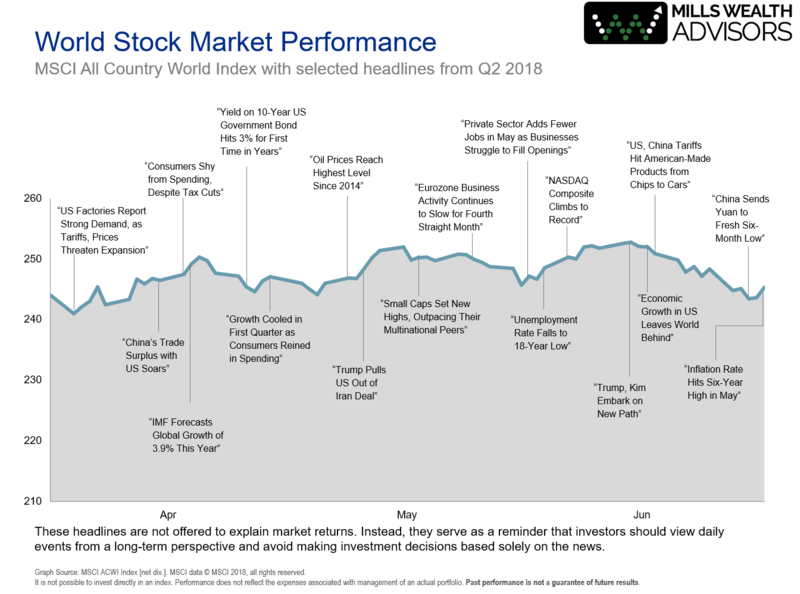 Below in our market commentary we discuss a few observations from MWA’s Quarterly market report that we post to our website each quarter that reviews all of the major investment categories performance. The first part of 2018 has been volatile to say the least. I want to remind everyone that investing is much like watching a man riding an escalator playing with a yo-yo. You can focus on the yo-yo or you can step back and look at the escalator. We can see this from Figure 1 and figure 2 in our update. Figure 1 is the yo-yo, going up and down, while figure 2 is the escalator steadily going up. The past quarter had ups and downs but ultimately didn’t really go anywhere. The past year we can see that the markets have gone up. If you would like to revisit your plan and risk tolerance, we would love to sit down, look at your current income, expenses and goals to determine if there needs to be changes made to your plan to align with your objectives and possible cash flows. Since money is measured in time not dollars, giving yourself a bigger cash cushion might allow you to sleep better. A second option, and often times more prudent in the long run is to simply ignore the financial media. With reoccurring headlines like “Market Plummets” or “Market Skyrockets” … who needs that extra stress? Emerging Markets were the best performer at the beginning of the year of the major assets groups we monitor, but the past quarter emerging markets like the other markets fell to level set in November (we recently wrote a blog regarding this if you would like to hear our thoughts on it). 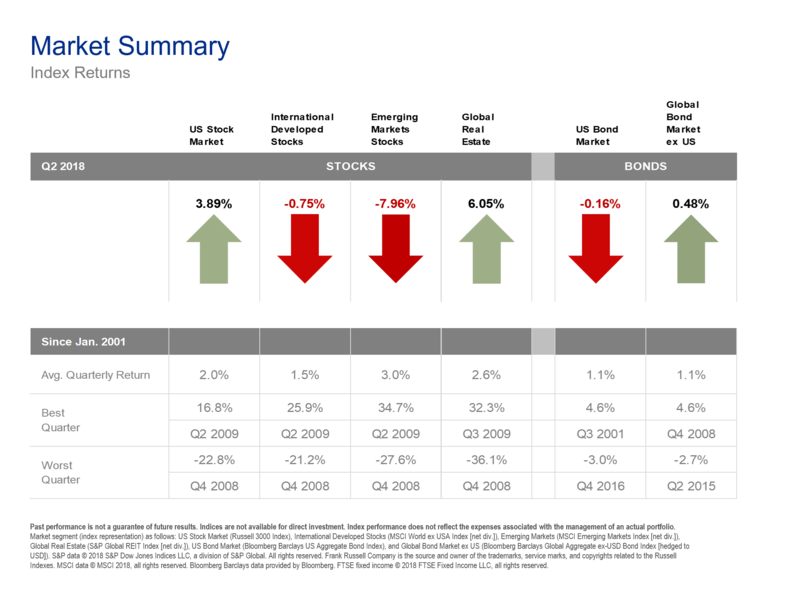 On page 2 of our Quarterly Review Package you will see a breakdown of the asset grouping and their 2nd quarter returns. I am of the opinion we should not show our clients numbers as short as one quarter because I think a short-term focus places emphasis on the wrong lesson. Markets are unpredictable over short time periods. They are just voting machines, however, as time increases so does the probability of success. When time periods are extended beyond 5 years investment markets become more like weighing machines. 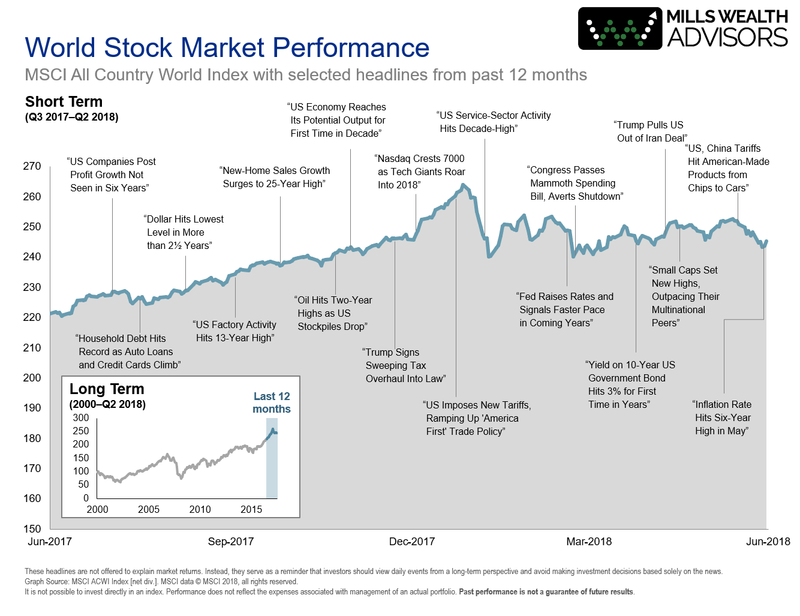 We want our clients to remember the 5-year rule, one of the most important lessons investor’s should know and follow: If you can’t give an equity (stock) investment 5 years to profit, you don’t have any business owning stocks. The risk is too high that you might need the money in a down market which can lead to short term thinking, and this is how fear can sneak in. Watching only a minute of any financial news channel the past few months you have heard about the trade war with China and how it will affect your portfolio. The truth is, since the US and China began putting Tariffs on imports from one another the US stock market has risen. This isn’t to say that there weren’t short term movements due to the news, but that is the yo-yo. It’s important in times like these to keep a focus on the escalator not the yo-yo. 5 Year Bonds are Yielding 2.72%, up .4% year to date. Even though short-term rates rose, the market was expecting the Fed’s increases and the long-term interest rates barely moved. What could this mean for your portfolio? The cost of interest could finally begin to rise making borrowing more expensive (remember that interest is still low by historical standards) and while more rate increases are currently priced into market futures markets are not expecting rapidly rising rates. We would recommend our client’s keep an eye on rates. Whenever your expected investment returns (net after taxes) are projected to be equal or less than debt interest rates we typically recommend that investors take the less risky option and consider paying down some of their debt. Also, we have been encouraging investors to keep bank balances invested in high yield FDIC accounts. Many of these banks we use are paying 1.5%-1.8%, while the big banks like Chase, Wells Fargo, Bank of America, and Citi are paying a fraction of that. Along with rising interest rates, this quarter has seen a rise in value of the US Dollar. A strong dollar is good for some and can be bad for others. American consumers benefit from cheaper imports and less expensive foreign travel. At the same time, American companies that export or rely on global markets for the bulk of its sales can be hurt. Emerging and International markets have been beaten up lately. That being said, we still believe emerging markets and international markets offer investors better valuations and better long-term portfolio characteristics. 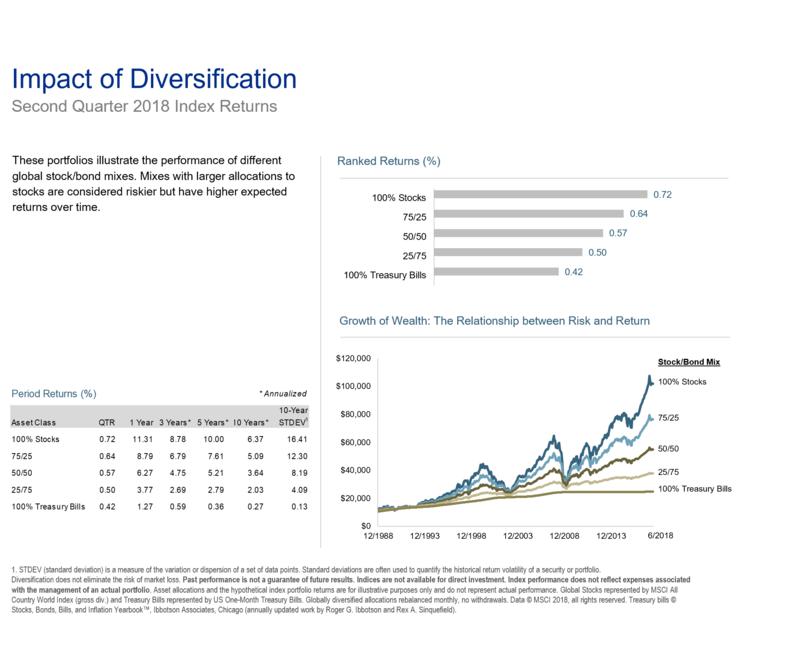 Global Diversification continues to offer investors higher risk adjusted returns. The picture above shows various assets and how they fared over the last quarter. We strongly believe in the concept that markets work and that the academic community provide investors with the most reliable source of unbiased financial information. 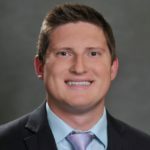 Here is a link to a video with Jake DeKinder of Dimensional Funds talking about the recent volatility in the market. Dimensional Funds is a fund company we like to have in our portfolios. They are a company who is known for using unbiased academic information in their portfolios and trading. I would like to welcome two new advisors to our firm! Stephen Nelson: An experienced advisor that is coming to us from Northwestern Mutual where he had worked the last five years. He is a Certified Financial Planner and is going to be MWA’s servicing advisor. He will be aiming to improve our technology, workflow, client interactions and communications. We are looking forward to him being a great addition to our staff! Michael Christians: A West Point graduate with over twenty years of experience. 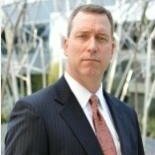 Michael just separated from Merrill Lynch. He will be affiliating with MWA under his own company name, Black Knight Wealth Management. We are going to help him leverage our infrastructure and back office while he transitions his accounts. As always, if you have any questions about your portfolio, your financial plan, or anything surrounding your family’s wealth-protecting it, saving it, or growing it, we are always here to help. Please do not be a stranger! With thousands of people retiring every day, if someone you care about needs help let us know. We would be more than happy to share our insight and expertise with them. We do not take your trust lightly, and we sincerely appreciate you and your business!